Very often, we find ourselves forming relationships with our couples after the wedding day. On this occasion it was the other way around. We already knew the story of Tristan & Claire even before they asked us to film their wedding day. With a tight knit circle of friends & family attending their wedding, it made it the more meaningful that they asked us to be a part of it. To see these two absolutely smitten with each other all day was beautiful to see and had the makings of a very happy marriage. Now for the day, starting off at their respective homes, preperations had plenty of animals, 3 dogs, and 2 cats to be precise. The ceremony was at Loreto Normanhurst where Claire went to school, and an old friend of Tristan' married them. 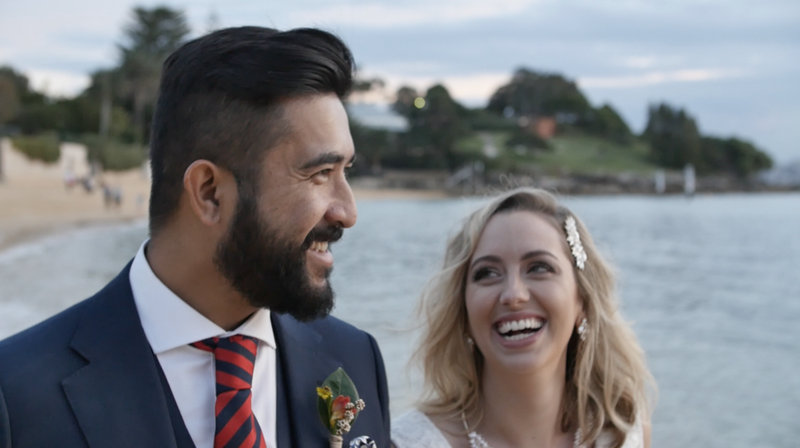 Heading off to the Watsons Bay Hotel where the reception room was decked out and drinks were flowing freely all night. Speeches from family & friends carried a lot of stories about the two of them, but when it came to Tristan' speech, you could hear a pin drop. It was then followed up a roar of excitement from the crowd as he announced that he had a special performance for Claire. Once the singing settled, tears were wiped away, it was time to hit the dance floor. Tristan & Claire, you guys are both amazing people and we are lucky to have you both as friends. Wish you nothing but the best and all the blessings for a happy marriage.